I will contact you as soon as I can with availability, and any suggestions or questions that I might have. 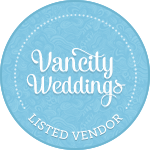 Note that availability can change quickly, especially during the busy wedding season (May-Sept). Long weekend Saturdays fill up especially fast. I can accept bookings up to one year in advance. Please see Holding Dates below if you would like me to hold a date for you. except for last-minute bookings and fees for holding dates, payments are held in trust by the VMA-AFM until after the engagement. All estimates are non binding. If you would like me to hold a date for you while you make a decision, i can do so for up to 14 days for events more than six weeks away at a non-refundable fee of $75.00 in Canadian Funds. This fee will be applied to your total fee if you decide to book with us. Please send an email forwarding all relevant details with your request. Your payment can be made with any major credit card through PayPal. We will try to accomodate last-minute bookings (less than 4 weeks notice). To secure your last minute booking, fees are paid in advance via any major credit card through PayPal. Please send an email forwarding your details with your request.